Nokia to Launch NFC Symbian Update While Looking Toward Windows Phone | NFC Times – Near Field Communication and all contactless technology. Nokia is finally releasing the software update needed to turn on the NFC features of its C7 smartphones, though the update might not arrive until August. Nokia is expected to introduce other Symbian NFC models this year and at least some of these phones–unlike the C7 or its recently announced MeeGo-based N9–will support card emulation and one or more secure elements, sources told NFC Times. But the phone maker continues to promote “Open NFC” applications that don’t require a secure element. And toward that end, Nokia has launched a service in the United Kingdom to help merchants and other businesses to roll out NFC tag-based promotional campaigns. Sources, however, say Nokia will not hit full stride with NFC until next year, when its first Windows Phone 8 models are expected to support NFC as part of its partnership with Microsoft. The first Windows phones from Nokia could be out before the end of this year but won’t carry the hardware to support NFC until 2012, sources said. Microsoft is definitely working on its own NFC wallet for the Windows Phone platform, sources with knowledge of the work by the software giant told NFC Times. This wallet is expected to be a feature of the Nokia Windows phones next year, and would compete with the Google Wallet. But it's not clear what applications Microsoft plans to support in the wallet and how many of the applications it or Nokia would provide themselves. Other handset makers supporting the Windows Phone operating system and NFC hardware could potentially offer the Microsoft wallet, too. 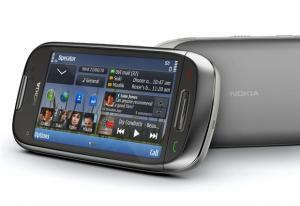 Until the NFC-enabled Windows phones hit the market, Symbian will be Nokia’s main NFC platform. The phone manufacturer’s long anticipated release of Anna, announced back in April, improves the user interface and will add the software support needed for what could amount to millions of C7 phones sold worldwide. Users can update the phones with Anna over the air. Nokia launched an NFC-version of the C7, called Astound, in April, only in the United States and sold through No. 4 carrier T-Mobile USA. With the release of Anna, Nokia will be able to fully launch its “NFC Hub,” an initiative in which the handset maker is getting directly involved in building and managing NFC tag-reading campaigns for small businesses and other organizations. Nokia is starting the launch in the United Kingdom, but plans to move offer the program in other countries, Rupert Englander, head of services sales and marketing for Nokia in the United Kingdom and Ireland, told NFC Times. The NFC Hub Web site launched two weeks ago. The program targets small merchants and other consumer-facing brands. Using the NFC Hub, restaurant and bar owners, for example, could enable their customers to tap their NFC phones on tags they set up in their establishments to check in on social-networking sites foursquare or Facebook Places or to “like” the merchants' Facebook pages or join their Twitter feeds. The campaigns could deliver other promotional material, as well. UK-based digital marketing agency Bolser is working with Nokia UK on the project. Nokia’s NFC Hub goes beyond just offering preloaded apps that use tag reading or peer-to-peer modes on its NFC phones, as the handset maker is doing with an NFC version of the popular Angry Birds game it is launching for the NFC-enabled C7. With its hub, Nokia is helping businesses set up and manage the entire campaign, including selling tags or full smart posters, which Nokia’s agents will program for the business with URLs linking their customers' handsets to mobile Web sites. Moreover, Nokia has built a back-end system that can host the Open NFC campaigns. The system keeps track of how many users are tapping on particular tags and the types of NFC phones they are using. And the platform enables merchants to change the campaigns in the cloud, without the need to reprogram tags already in the field with new URLs, said Englander. The original URLs will be programmed in the tags, which would then be locked. When a user taps, his phone would be redirected to a new site. Englander said the platform would enable a merchant, for instance, to change its promotional offers weekly or monthly on the back-end. Locking the tags after the first programming also prevents them from being reprogrammed by hackers or mischief-makers. “That’s (NFC Hub) something we’re offering brands free of management fees,” Englander told NFC Times, adding that Nokia will provide anonymous user statistics to help the merchants or other organizations gauge the effectiveness of their campaigns. All this is apparently designed to sell more Nokia phones and provide some extra promotion for the handset maker’s NFC efforts. Smart posters from the NFC Hub will carry a “Powered by Nokia” label along with the N-mark logo of the NFC Forum standards and trade group. But Englander contends that the NFC Hub platform supports other NFC phones, such as Google’s Nexus S. The Web site does, in fact, list other NFC-enabled phones, not only those from Nokia. He added that as Nokia develops the tag-reading platform, it could seek to earn revenue from licensing or related areas. But it hasn't “defined,” those possible revenue-making opportunities. In any case, while NFC phones supporting secure elements are coming from Nokia, the handset maker is sticking by its emphasis on NFC applications that don’t require a secure element for now. Nokia has said there is more than twice as much revenue to be made through 2013 from enabling NFC tag-reading and P2P applications, including delivering advertising and offers for merchants, than from applications stored on secure elements. But it hasn’t released the internal estimates it has used to make that projection. Nokia was involved in an NFC tag-reading demonstration project this past spring in London, with UK-based NFC application company Proxama, along with outdoor advertising agency Posterscope and its Hyperspace arm, to enable a small number of users to tap movie tag-embedded posters of the film, X-Men: First Class to view a preview clip and link to the film’s Facebook page. Nokia and the other suppliers are working on a similar project scheduled to launch next week involving reality TV show Basketball Wives, with a limited number of smart posters set up in New York and Los Angeles. The idea is to use these and other smart posters as a medium for advertisers to deliver links to promotional videos and offers, based on location and possibly more in-depth user profile data. At £6 (US$9.57) apiece, tags sold on the NFC Hub site are steep. In addition, a single tag that can deliver business card contact details in the vCard format costs £11 and smart posters start at £20. Englander defends the prices, saying they are for orders in very low numbers and Nokia doesn’t plan to profit from them. But other vendors are offering tags with cheaper prices, including the Identive Group, which seeks to play off its contract with Google to provide tags for at least one Google Places NFC project in the United States and has launched a site selling tags and other NFC equipment. Nokia also rejects the idea it is trying to control the infrastructure for delivering information via NFC tags or to muscle out other vendors gearing up to provide platforms to deliver tag-reading applications and manage content.